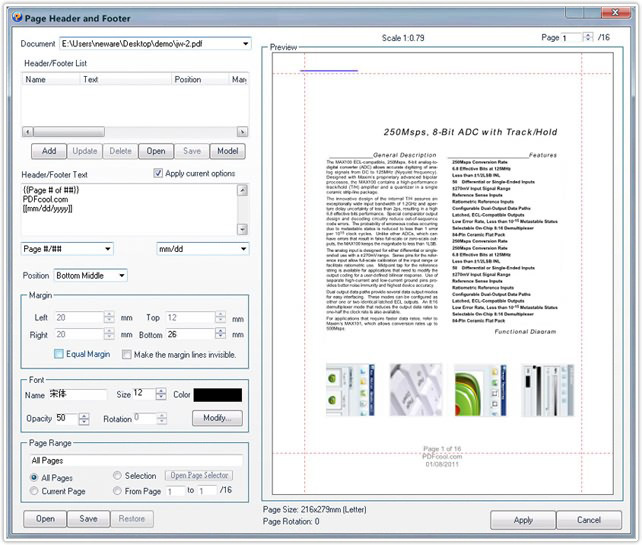 Header/Footer tool enables you to quickly insert header/footer into a PDF document, and place it in front of or behind existing page content, depending on your preference. Best of all, by saving your header/footer options as project files, and you can reuse them over and over. Click on the Model button, you can choose a header/footer model provided by PDFCool team. Note: Check the "Apply current options" to preview the current header/footer options. Note: When the header/footer text is single line, the rotation options is available. 8. Click on the Apply button to finish. Note: By clicking on the Open, Save or Restore button located in the bottom left corner, the user can choose to open header/footer project file, save the current header/footer options as project file, or restore to the default values.